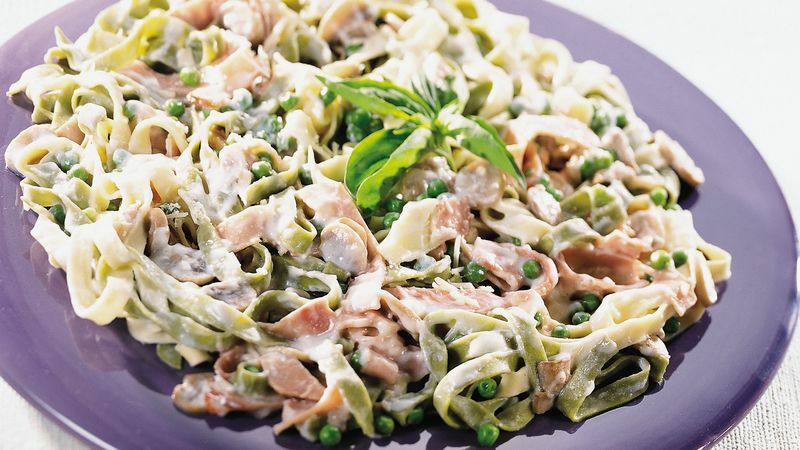 In Dutch oven or large saucepan, cook fettuccine to desired doneness as directed on packages, adding peas during last 1 to 2 minutes of cooking time. Drain. Return to saucepan or place in large serving bowl; cover to keep warm. Meanwhile, melt margarine in 12-inch nonstick skillet over medium-high heat. Add mushrooms; cook and stir 2 to 4 minutes or until tender. Add ham; cook and stir 1 minute. In small bowl, combine 1/2 cup of the milk and the flour; blend until smooth. Gradually stir in remaining milk. Pour into skillet; cook over medium heat until mixture is bubbly and slightly thickened, stirring constantly. Reduce heat to low; stir in cream cheese and nutmeg. Cook until cream cheese melts, stirring occasionally. Pour sauce mixture over cooked fettuccine. Sprinkle with Parmesan cheese; toss gently to coat.